Our patient is a 65-year-old male who was unhappy with tired and aged appearance of his eyes, specifically the sagging upper lids, drooping eyelids, under eye bags, and loose under eye skin. 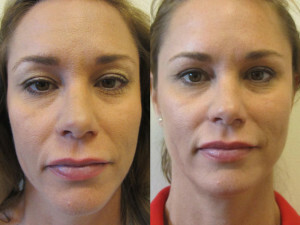 The patient saw Dr. Traci Temmen in consultation at the Plastic Surgery Center of Tampa. 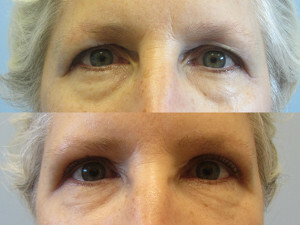 He then underwent an upper eyelid lift, lower eyelid lift with fat removal and redraping, brow lift using a browpexy technique, and Botox to the vertical lines between the eyebrow. Postoperatively, there is an refreshed and youthful appearance to his eyes, no lower lid bags, and now extra eyelid skin. Our patient is a 43-year-old female who has been unhappy for years with the tired appearance of her eyes and extra upper lid skin. 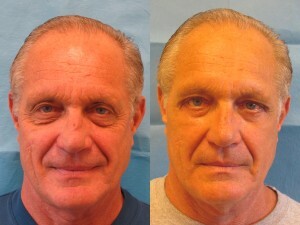 Dr. Temmen proceeded by performing a blepharoplasty. The patient is very happy with her post-surgical results. Our patient is a 40-year-old model was bothered by her “tired” appearance and difficulty putting on eye makeup caused by excess, sagging upper eyelid skin. The patient felt that the loose, “crepey,” and wrinkled skin of her upper eyes made her look angry and older than she actually was. Dr. Traci Temmen performed an upper eyelid lift, also known as an upper blepharoplasty, through a small, imperceptible incision in the patient’s eyelid crease. Despite the fact that she looked beautiful before surgery, an upper eyelid lift made this patient look even more youthful, alert, and refreshed. Dr. Temmen can perform eyelid lift surgery at the Plastic Surgery Center under local anesthesia (with the patient awake) or under general anesthesia (with the patient asleep and breathing with the help of a breathing tube), depending on the patient’s needs and desires. This female patient came to Dr. Traci Temmen at the Plastic Surgery Center of Tampa complaining about the tired, drooping appearance of her upper eyelids. The patient desired an upper eyelid lift surgery, also known as a blepharoplasty, to remove her excess eyelid skin and give her a more youthful and refreshed appearance to her upper face. 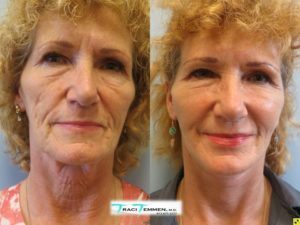 Dr. Temmen performed a blepharplasty under local anesthesia with IV sedation at the time of her facelift, neck lift, and chin implant surgery. The patient recovered quickly with no complications and was able to return to work in ten days. Our patient is a 59-year-old, beautiful woman was generally pleased with her appearance but felt her upper eyelids were “showing her age.” She decided to undergo a blepharoplasty procedure, or upper eyelid lift, with Dr. Traci Temmen at the Plastic Surgery Center of Tampa. 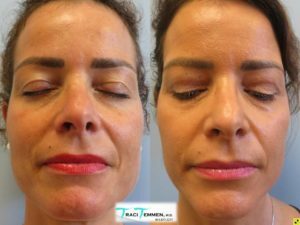 Dr. Temmen performed a conservative eyelid lift with removal of excess skin and a small amount of fat from her upper eyelids. This surgery was performed in an outpatient setting, under local anesthesia, in less than an hour. The patient recovered quickly at home and was back to work in less than a week. 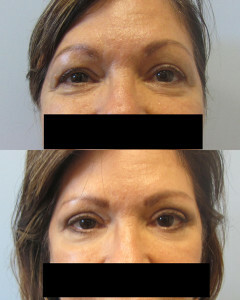 Postoperatively, the patient is ecstatic with the youthful, natural, and rejuvenated appearance of her eyelids.